To a large extent, the availability of water determines the species composition of a particular area, with desert-adapted mammals thriving in arid environments. The provision of artificial water can attract many species adapted to less harsh conditions, which can render an area more attractive for tourism operators, and can distribute potentially damaging species, such as African elephant (Loxodonta africana), more evenly across a landscape. Previous studies have shown that artificial water provision can have detrimental effects on rare species that are exposed to more common, water-dependent species, especially when the latter are stronger competitors. An increase in the abundance of wildlife could attract more predators, which, in turn, could increase predation pressure on species that inhabited the area before water was provided. This project is in collaboration with the Feline Fields Trust, who have a lodge, Maru a Pula, in the NG3 concession in north-eastern Botswana. This area is in the Kalahari Desert, but is also home to several cattle posts, all of which already provide water for their livestock. At Maru a Pula, several artificial water points will be pumped during the dry season in a bid to attract wildlife for tourists, but also in keeping with advice from the Department of Wildlife and National Parks of Botswana. We aim to quantify the current species composition in the area, and monitor any changes over the course of several years following the initial pumping of the artificial water points. We will deploy 31 camera traps in a grid covering 100 km2, centred on the artificial water points around the lodge. We will collect images from these camera traps every six weeks and identify all mammalian species photographed by the traps. We will compare data from the same seasons in different years to identify any changes in species composition. We collected images from the camera traps deployed between July and October 2015, during the dry season prior to the initial filling of the water holes. As from October 2015, three water holes are being pumped to provide permanent artificial water sources. Usually, during the rainy season (November - March), sufficient rainfall increases water availability across the landscape, but this year (2015 - 2016) has been exceptionally dry, so animals in the study area are likely to rely fairly heavily on these artificial water points. We identified several species occurring in the study area during the initial, dry phase prior to water provision. 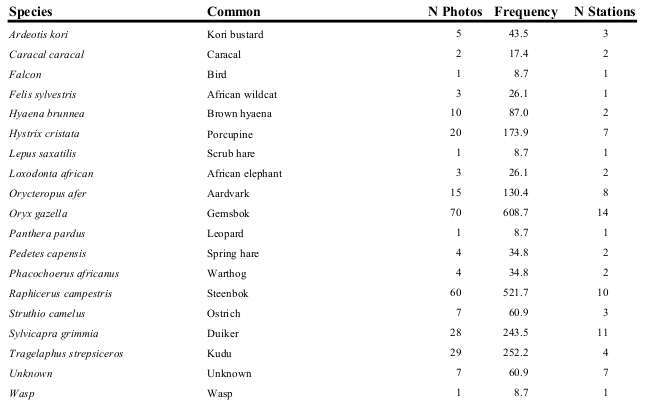 Gemsbok, steenbok, duiker and kudu were the most commonly occurring species.